"When the troubles first started in "Central Ferusia", the complex where all of our nation's criminals are sent to serve their punishment, nobody batted an eyelid. We thought that the government had everything under control because the strength of our military had been demonstrated multiple times in the past. Even when the walls of the complex were breached and criminals started to escape into the streets, we believed that the riots caused by common criminals and anti-government rebels would be quickly put down, and that future generations would only remember their efforts as a ridiculous, treacherous ploy. We believed the government when they told us that the military had full control of the riots, and sat happily in our homes as the curfews and blockades dragged on and on and on. We didn't think for a moment that the government could possibly be wrong. After all, we had the most powerful military in the world protecting us! The idea that these riots would ever cause us problems sounded like a tasteless joke. The streets seem dead where I live, but each night I hear the riots getting closer as the military's blockades get pushed further away from the walls that were supposed to keep these criminals contained. What am I supposed to do? I'm trapped in an apartment full of gadgets I can't eat, paid for by credits I can't drink, with a panoramic view of the violence making its way towards me. I don't care what the government tells us anymore. I'm not safe here. I have to get out!" ~ Diary of Cheska Frederick, Ferusian Citizen. Sore Losers: Riot Grrrl is a highly experimental game where nearly everything you do involves some kind of minigame; from searching areas for items to lockpicking doors; from hotwiring electrical equipment to dodging rioters; from arguing with NPCs to hacking into computer systems; from breaking through barriers to sneaking around enemies. Why? Because I wanted to make an RPG where character abilities aren't reliant on a lifeless table of stats, and are instead reliant on the skill of the player. Hopefully my excessive use of minigame sequences is going to achieve just that. Battles are also going to be more interactive than in a standard RPG. In Sore Losers: Riot Grrrl you'll be able to knock weapons out of your opponent's hands, kick bookcases over onto people, throw your enemies into electric fences, and use human shields to stop enemies from being able to attack you; you'll basically be able to use multiple elements of the battle environment to get your own way. Why settle for just the weapon in your hand? Use everything to your advantage! Additionally, most of the graphics will be custom-made for the project in a purposefully high-contrast manner that will give the game a drastically different look. The game will also feature vibrant, abrasive chiptune soundtrack. As such, there will be a strong, stylistic element to this game that may well end up being divisive, but I believe it will also lead to a very unique gameplay experience! I really like the presentation. The way cutscenes appear to be handled looks great, the color scheme is nice, and the Earthbound-ish map design is great. I have to admit, that's the first time I've ever seen anyone describe the graphics as resembling Earthbound. It's definitely not intentional, but simplistic graphic styles do seem to attract that comparison. What a unique and NES-like old school style! Bet it flashes too much for me to play though. XD Still I may DL it and try it out. I like those NES style color, that vibrant purple/pink. It all looks very interesting. There's a very minimal amount of flashing in this game. Most of the maps are static, only a couple have animations. I haven't really done any work on this game since Fallout 4 came out back in November. Fallout 4 took up most of my free-time throughout November and December, with the rest being taken up by all the shopping and parties and dinners and general-get-togethers that Christmas brings with it. It's been a fun couple of months (some random bouts of nausea aside, but I'm taking medication for that now!) but it's really time that I start working on this project again. Not that I don't find working on this game fun, it's just that I've really saddled myself with a lot of tedious tasks to do. In any case, I really want to get this project finished by the end of this year. It's been going on for far too long now, it's actually kinda ridiculous! I was working on the vent-crawling minigame back at the start of November. 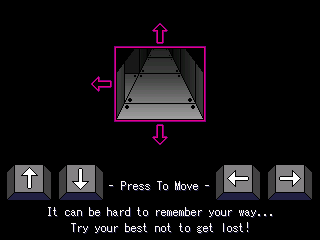 These sections are handled in a style similar to the dungeons in the first Phantasy Star game, in that you're shown a first-person view of what's immediately in front of you and then get to choose which direction you want to travel in. It's really easy to get lost in these areas, so it's really up to the player to keep careful track of where they're going so that they don't end up going in circles, and that's where the challenge in these sections comes from. Hopefully people aren't too put-off by what is a fairly old-school approach to labyrinthine puzzle design, but I've always liked dungeons that are set up in this kind of manner. Another thing that I've been doing is bringing the "convobattles" (which are basically rock-paper-scissors in how they work) in line with the aesthetic applied to all the other minigames. This actually entailed a lot of work, more than I was originally expecting when I set out to make these improvements. When the "convobattles" were first implemented, only dialogue from the opponent that continued the "convobattle" was shown as an image. All other text was shown using a normal message box, including all instances of Cheska's speech during these "convobattles". This meant that each "convobattle" only needed 3-5 images producing. When I started updating the graphics, I quickly decided that all the dialogue should be shown in speech bubbles so that the same aesthetic was maintained throughout the course of the whole "convobattle", which meant that loads of new images needed to be created. It ended up being pretty tedious work, but I'm happy with the results! I'm also happy to say that all the "convobattles" in the game have now been updated, which was something I only just finished doing on New Year's Day. The ability to avoid combat by getting these minigames right is going to play a big role in how different players end up experiencing this game, because many battles can be avoided if you get the associated "convobattle" right. I'm not currently planning to have your success rate in "convobattles" have an affect on the ending, but it's something that has come to mind in the past. Definitely something for me to think about as I come to implement the closing scenes of the game! All the blog posts I've made since starting to work on development of this game again have been about updating things that were already implemented. Whether that meant replacing minigames with whole new minigames, updating graphics or simply adding more instances of under-utilised minigames, I've essentially done a lot of work without getting any closer to finishing this game. But that's okay! Why? Because this game is a hell of a lot better now than it was when I came back to developing it! Banzai this game looks mondo heavy, bra! The graphics are a glassy pipeline and that non-stat based game play looks mondo unique! Everything looks gorgeous, I like the "convobattles" idea, which can avoid you to battle (and looks a bit like my own CBS actually xD). Like the vents as well. Overall looks like a good job really. Congrats! If that's the .GIF that I think it is then yes, yes I do. I think that first-person dungeons like that are really under-utilised in JRPG games. To be fair, they are a bit tedious to make, especially if you're using an engine like RPGMaker that isn't really built to handle them, but they're worth it simply because they're unique. Thanks This game does actually have standard JRPG battles as well as all the other minigames that I'm throwing in, I just don't want battles to be the bulk of the gameplay. I want them to be one amongst many things that will distract you as you try to explore and puzzle your way through the game. The "convobattle" idea is basically just rock/paper/scissors in execution, but trying to work out the tone that the "opponent" is speaking in means that the result isn't as random as it would be with a straight rock/paper/scissors minigame. That said, I definitely took inspiration from the rock/paper/scissors minigames in the Alex Kidd games when coming up with that system.